The brand spanking new 'A' product range from the innovative new design company 'By Alex' was launched during Design Week at an event at Woodbridge and Rees Gallery in Clerkenwell. 'By Alex' develops products using only sustainable materials and manufacturing processes. 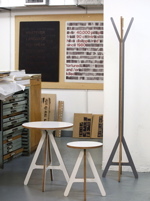 The 'A' Range is a witty expression of a love of typography married with a wide-ranging functionality, made of birch plywood. I would group several of the side tables and stools together as a set of plinths on which to display glass 'objets' or small sculptures, their inherent simplicity would be a good counterbalance for decorative items. The stool could also serve as a bedside table for a small space, or a resting place for a dirty martini..........you could have hours of fun thinking of your own imaginative uses for this fabulous product! First presented at 100% Design 'Inlaid Fantasies' by Andreea Mandrescu really captured my imagination. An innovative new material consisting of rubber, fabric, leather and fur which can be used in interior instillations or fashion, this illustrious, otherworldly concoction brought to mind a chaotic but beautiful collage of inter-galactic androids and iridescent insects. 'Inlaid Fantasies' would be equally at home in a space ship interior as it would in a Mayfair Townhouse! 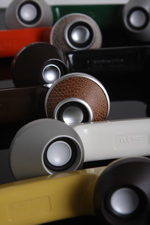 This cheeky little newbie is a clever product that upcycles old Bakelite Telephone Handsets into speakers for MP3 Players. A really cute, humorous and of course ethical product, for me it ticks all the right boxes, I'm sure Uncle Oswald would be proud!!! I particularly like the mock-croc decorative finish that I could imagine blending in nicely with a gentleman's study.